Experience New York City’s top attractions on this unique, all-day hop-on hop-off cruise. One ticket is all that’s needed to see the city. Enjoy breathtaking views of the Manhattan skyline, plus iconic landmarks like One World Trade Center’s Freedom Tower, the Empire State Building, the Statue of Liberty and much more from New York Harbor. This cruise includes entry to the One World Observatory. Your hop-on hop-off ticket is valid for one day, allowing you to design your own sightseeing itinerary for your trip to the Big Apple. Hop on and off as often as you want, and enjoy informative and amusing commentary as you go! The boats will give you up-close views of the Statue of Liberty, Ellis Island, the Brooklyn Bridge many more New York City sights. 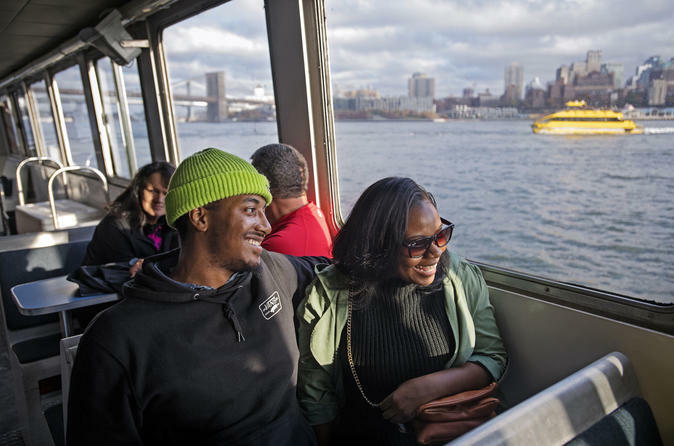 By traveling around the city on the cruise, you’ll beat the infamous New York traffic and enjoy easy access to hundreds of sites like the 9/11 Memorial Memorial, Chelsea Piers, the Intrepid Sea, Air and Space Museum, Times Square, DUMBO and Williamsburg. Boats depart regularly throughout the day from six stops (see Itinerary section below for stops) so you can plan your day around your sightseeing! Special Offer - Book by August 31 to save 7% off our previously offered price! - Book Now!